If your choice of a small luxury sedan comes down to a race for the best between the 2018 Audi A3 and the Mercedes-Benz CLA 250, then head over to Audi Oklahoma City because the A3 laps the CLA in everything that matters to drivers. To start, the A3 stands out more in a crowd. Unlike the CLA250, which looks like almost every other sedan on the road, the A3 offers a sleek, aerodynamic design that is uniquely Audi. The A3 also offers more standard comfort and convenience feature, a more user-friendly infotainment system, more top end horsepower, a more affordable base price and new features for 2018 like standard heated seats, 2 USB ports, new safety tech to the Premium Plus trim and the new RS3 high-performance model. The 2018 Audi A3 comes equipped with a 2.0-liter turbocharged engine that delivers up to 186 horsepower that can easily be increased to 220 horsepower when you upgrade to Quattro all-wheel drive. Still not powerful enough for you? No problem. The S3 trim cranks out 292 horsepower while the all-new RS 3 rips and roars with 400 horsepower. Even the performance based top end trim CLA45 can't keep up with that. It only delivers 375 horsepower - just a few more horses than top trims of some economy cars. In the 2018 Audi A3, you'll also be able to cruise the streets of Oklahoma City longer than you would in the CLA 250. While the CLA 250 gets an EPA-estimated 24 MPG in the city, the 2018 A3 gets an EPA-estimated 26 MPG in the city. Factor this into a lower purchase price and there really is no good reason to buy the CLA 250. Wherever your journey takes you, the 2018 Audi A3 will get you there - and keep you entertained along the way with its 10-speaker sound system, HD and satellite radio, 2 USB ports, panoramic sunroof and available Apple CarPlay™ and Android Auto™. Ergonomics is on display in the A3, providing drivers with heads-up controls on the steering wheel as well as an infotainment control knob strategically placed on the console between the driver and front seat passenger. Other available tech features include a 14-speaker Bang & Olufsen audio system, push button and remote start. The 2018 Audi A3 has received a 5-star overall safety rating from the National Highway Traffic Safety Administration. In addition to standard features like rearview cameras and rain-sensing wipers, the Audi A3 also features unique standard safety features the CLA 250 doesn't. The A3's Pre Sense Front and Audi Pre Sense Basic are systems that prepare you and your vehicle once the A3 senses a crash is imminent. Pre Sense Front includes a front collision warning and brake assist while the Pre Sense Basic prepares the vehicle for a crash by closing windows and the sunroof, tightening seatbelts and activating hazard warning lights. When it comes to choosing the right small luxury vehicle, there's really no comparison. 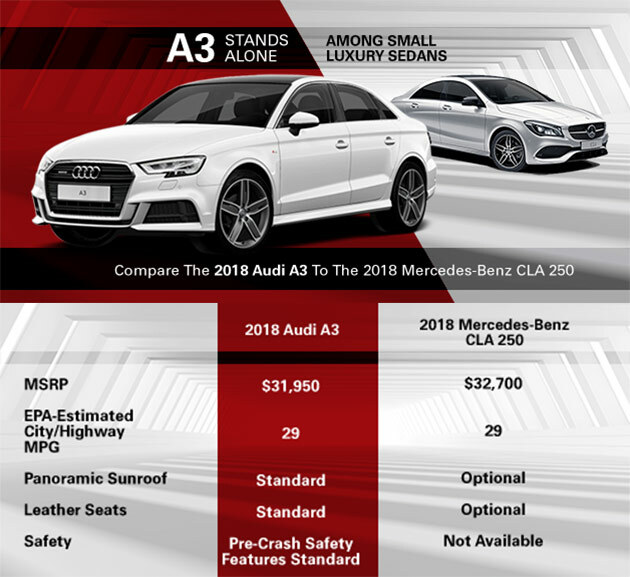 Discover how the 2018 Audi A3 leaves the 2018 Mercedes-Benz CLA 250 far behind!